This is the 11th week of Reddit’s 52 weeks of cooking challenge, the theme is Arctic and I had to stretch to find something to make to fit the theme. My initial reaction was salted meat or canned food, staples from Arctic exploration, but the note that went along with this challenge said you could do something from a country that is part of the Arctic circle. I looked into different styles of Scandinavian breads but didn’t feel inspired by rye bread or loaves stuffed with seeds and nuts. I settled on an Alaskan theme, in Bellingham the Schooner Zodiac is docked next to the Alaskan Ferry, so it felt fitting. When I think of food from Alaska it’s mostly meat like salmon, bear and moose, plus wild blueberries. I visited an Alaskan island when I was 6, flew in on float planes and stayed in a tent on a wooden platform with my family for a week while we fished and hiked the land. We found a clutch of tiny blueberries and picked as many as we could, that evening my dad made pancakes. My mom suggested that we wash them, but it had just rained that morning so my dad shrugged his shoulders and said they would be fine. Lo and behold a tiny worm poked its head out of a blueberry that was in a pancake on the griddle being cooked alive! We squealed and said that my dad had to eat that pancake, a little extra protein he called it. For this week’s challenge I made sourdough buckwheat pancakes, they could have done with some fresh blueberries in them, minus the worm. These pancakes are not sweet at all; they are almost savory with the amount of sour punch you get from the sourdough. 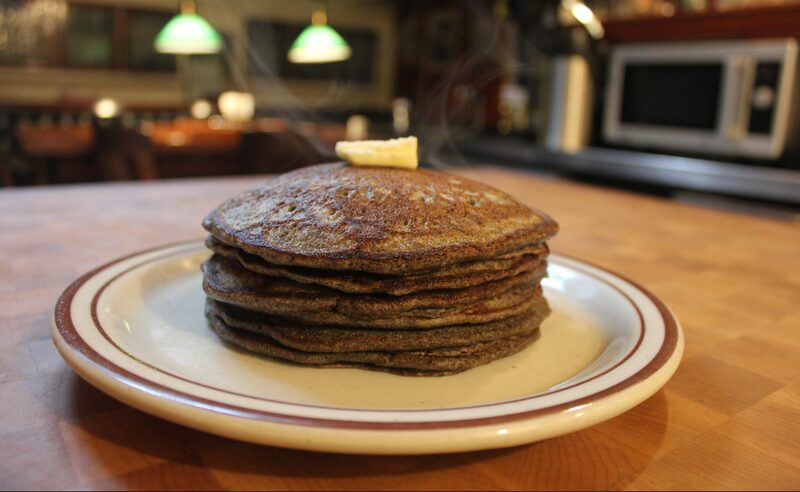 The buckwheat flour adds great grassy flavor and a little gritty texture that you can’t get from any other flour. These pancakes have to be prepped in advance, the night before you want these for breakfast you have to mix a few ingredients together to make the sponge, this allows the sourdough to grow and add flavor to the whole batch. I can’t wait to make these again when I have some fresh blueberry syrup to go with them, for now they were just great with maple syrup. The night before you want to eat these pancakes for breakfast mix together the flours, sourdough starter and water. Cover with a lid and leave in a warm place overnight. Your mixture from the night before should have bubbles on the surface and smell strongly of sourdough. Add the remaining ingredients and mix until just combined. On a preheated griddle greased with butter ladle the batter, wait until the edges start to dry and bubbles come to the surface, flip and cook the other side until golden brown. Serve immediately for best results.